Edmonton – Leading video game developer BioWare™, a division of Electronic Arts Inc. announced today the highly anticipated details of all six Origin Stories featured in the upcoming dark, heroic fantasy Dragon Age™: Origins. Each Origin Story starts the player off with a unique series of locations, characters and events that establish their motivations and lay the groundwork for the adventure to come. As one of the last “true elves”, you were content to spend your life wandering with your clan… until a chance encounter with a relic of your people’s past threatens to tear you away from everything you’ve known. You have always lived under the heavy thumb of your human overlords, but when a local lord claiming his “privilege” with the bride shatters your wedding day, the simmering racial tensions explode in a rain of vengeance. Born caste-less in a land where rank is everything, bound as the lackey and thug of a local crime lord, you have spent your life invisible… until chance thrusts you into the spotlight, where you can finally prove whether you will be defined by your actions or your birth. The favored child of the dwarven king, you proudly take up your first military command… only to learn that the deadly intrigues of dwarven politics pose an even greater danger than that faced on the battlefield. Gifted with a power considered a dangerous curse by most, you have spent most of your life secluded in the remote tower of the Circle of Magi to be trained and watched closely by the dreaded Templars. Now your final test is upon you — succeed and prove your strength, fail and you will perish. Born to wealth and power second only to royalty, you find your training in both diplomacy and war put to the test when your father’s castle is betrayed from within on the very night your elder brother is to lead the family’s forces to war. The player’s choice of Origin Story lays the foundation for a profound journey based on the character’s past experiences, establishing how they perceive the world and how the world perceives them. The choices you made during an Origin Story will influence the way the game unfolds, including different story elements, dialogue options and even plot branches, providing a wealth of replayability. 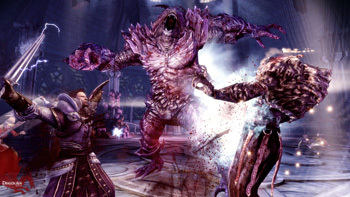 Dragon Age: Origins offers an immersive, beautiful and often threatening world in which the player will live out a fantasy of epic proportions. With six unique paths to choose from, the choice of Origin Story will be the first of many important decisions players will face in Dragon Age: Origins. This entry was posted on Thursday, February 12th, 2009 at 8:59 am and is filed under Rating Pending, RPG - MMORPG, Upcoming Releases. You can follow any responses to this entry through the RSS 2.0 feed. You can leave a response, or trackback from your own site.